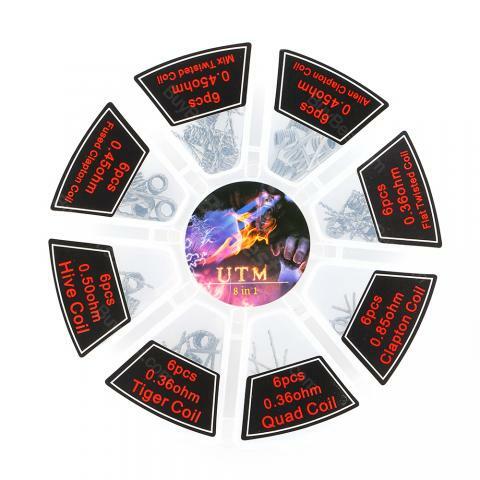 The 8 in 1 Prebuilt Coil Set packs 48 pieces Kanthal coils with 6 types and various resistance. Perfect choice for DIY lovers. The 8 in 1 Prebuilt Coil Set comes with 48 pieces of Kanthal coils with various resistance and different types. It is easy to wrap and wick, which is perfect for DIY lovers. I'm down for it, one of the best simple to build easy to set it up I am soooo happy i made the decision to buy this A very good Arrived on time. Arrived in perfect condition. Good product. Completely satisfied. Top guys! Couldn't of asked for much more. Great for beginners, or even if you get caught short for time and need to make a build quick. Decent coils with from Vapefly.